Who’s more sensible? Humans? Or Monkeys? Meet Yale psychologist Laurie Santos. 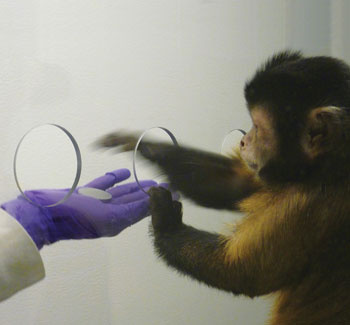 She researches human buying habits by having monkeys barter for treats. She says Capuchin monkeys understand economics. She gives them tokens—monkey money! Her monkeys are trained to exchange the tokens for munchies, in fun but educational games. For example, she might give monkeys two apple slices in exchange for a token. Another researcher might give only one. The monkeys aren’t chumps! They learn who gives the better deal! Recently, Santos was curious about an irrational human habit. We usually assume that expensive items are of better quality, even if they’re really not. To find out, Santos let her monkeys buy treats. They could choose, say, three of treat A for one token, or one of treat B for three tokens. What happened? Price didn’t impress monkeys. They mostly just bought their favorite. She says this shows that humans’ decision making is more arbitrary than Capuchins’. Not that my new iPhone isn’t a hundred times better! It costs way more!